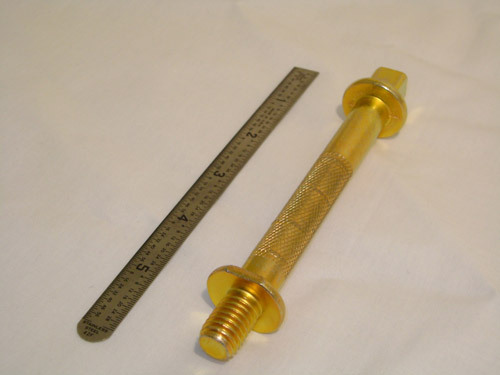 At Acme Screw Corporation, we are experts at applying cold heading to create unique or unusual parts. When a client in the appliance industry approached us in need of cold heading for a 1010 steel stand-off, our experts knew exactly where to begin. The square and collar ends were formed on a conventional cold header. It was then fed into a rod heater to extrude the threaded section down to the right size and to form the collar above. We performed a final trimming operation to create two flats on the collar at the threaded end. We then plated the part with zinc with yellow dichromate, finishing it as a securing anchor. Based on our customer's specifications, the finished part measured 5.617" long and had an O.D. 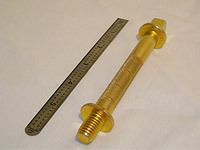 of Ø1.024", while maintaining tolerances of +.000/-.010". They were thrilled to find that our methods produced the exact results they were hoping for, and proved economical. To learn more about this project, or to find out how we can serve your specific needs, please contact Acme Screw Co. Overall Part Dimensions Length: 5.617"